Another Doctor Who audio post on the latest the Eighth Doctor has to offer! This time it's a miniseries that acts as the fifth season of the Eighth Doctor Adventures. I got the impression this was a potential jumping on point for new listeners, so I decided due to monetary constraints, to skip the more expensive first four seasons. This was not the wisest of decisions, but I'll get into that later. I'll be reviewing all four episodes as one, since doing them individually would only create a lot of repetition. The Doctor has been devastated by recent loses and is looking for hope. The Time Lord Straxus promises he will find that hope on an important mission. The Doctor is sent to save Molly O'Sullivan from an unknown foe during the height of World War I. As you can probably tell by the short description, my decision to skip the first four seasons was a poor one. This adventure had me going back and forth over whether I liked it or not. The actors were fantastic and when there wasn't action going on it was usually pretty good. However, there were just some parts that reminded me of the worst of the new series of Doctor Who: the Daleks are stormtrooper-esque pawns, the sonic screwdriver's railroad fixing setting, and about half of episode three (you'll know what I'm talking about if you get there). That said it also contained some fantastic character interaction, some intriguing mystery and some great music. The Eighth Doctor is angry and exhausted at the start and is very reminiscent of the Ninth Doctor. My favorite parts were when the Eighth Doctor and his new companion Molly just talked about their feelings. This provided an emotional depth that helped me get through some of the poorer sections of this audio. There were parts when he had emotional breakdowns that resulted in a kind of yelling fit that was definitely not a great addition. With that exception, Paul McGann (the Eighth Doctor's actor) is definitely one of the strongest parts of this story. Molly O'Sullivan starts off a bit harsh, but is a great match for the angrier Eighth Doctor. She injects levity and comedy through episodes two and three. As always, they have a great deal of fun with her being out of her own time. She also, has some surprisingly dark and worrisome turns that balance things out. Straxus is a popular character from the previous seasons of the Eighth Doctor Adventures. He is a typical conniving high level Time Lord in this. He seeks to manipulate the events to his own ends and will use anyone to get his way. I wasn't too impressed by him, but I think the plot really let his character down. Kotris or 'X' starts off as a mysterious figure with a plan and gradually works up to main villian. He is fantastically portrayed by Toby Jones (The Dream Lord from series 5 of Doctor Who). Later the Time Lords designate him X (during first half of the last episode). It seemed very arbitrary and I preferred Kotris. The Daleks are sadly back to their new series standard with terrible aim and a willingness to accept surrender. These are not the Daleks I enjoy. Daleks are insane killing machines, so they'd better have a great reason for not shooting and killing first. In this, they tend not to. The music is fantastic and serves to make the emotional and dark moments tremendously effective. Unfortunately the actions scenes, and there are a lot, lack tension and began to wear on me. I've complained about the Daleks already, but there a great many scenes that I had trouble visualizing exactly what was going on. Audio seems to work best with short stretches of action interspersed with explanation. The long and bizarre stretches in this just don't work and kill the serious mood provided by the engaging dramatic character scenes. The end was about as convoluted as the rest of the story. It wasn't bad, but it wasn't particularly good. I really got to love Molly right before the end and I cannot overstate how much I loved the character writing and music. I guess the main issue with this story is: does character beat plot? Normally with me that is a complete yes! With this one, I am a bit mixed. I really think that you need to hear the other seasons of the Eighth Doctor Adventure before this. It doesn't quite spoil anything, but it comes as close as you can without it. That said, I can't give it a wholehearted recommendation. More like a "listen at your own risk." There are vastly better Eighth Doctor stories and you should listen to them first. I may update after I get round to the other seasons, but that will be awhile. 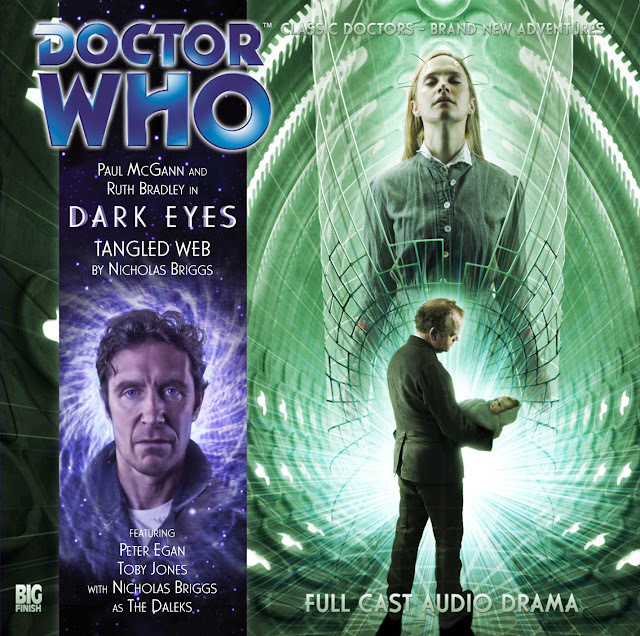 Buy it here from Big Finish or start with the rest of the Eighth Doctor Adventures.